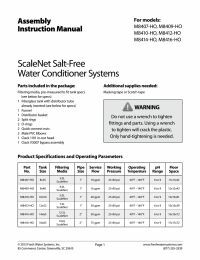 The ScaleNet Salt-Free Water Softener Conditioning System's Template Assisted Crystalization (TAC) media, also known as Matrix Enabled Particularization or MEP process, transforms calcium ions into calcium crystals, which are stable and cannot attach to pipes, surfaces, hardware or heat exchanger components. The crystals are so small they are easily rinsed away by the water flow. The ScaleNet High Output Systems include the V3007 PVC 1" NPT Male Elbow Assembly and the V3006 Bypass for the 1" Valve. Go to Clack Parts and Accessories to purchase other Clack Valve attachments for PVC, Lead-Free Brass Sweat, 1" Male NPT, or Brass Sharkbite Quick Connect Fittings. As shown below, SCALE is the incrustation of calcium carbonate (CaCO3) that forms within piping. How Does TAC (Template Assisted Crystallization) Media Prevent Scale Buildup? 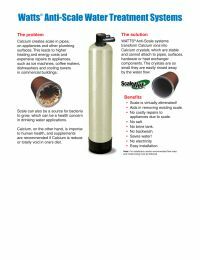 Disclaimer: If you are using well water, please contact our technical support staff to help you determine if this system is right for your application. 3-5 years based on hardness and chlorine levels.